What is Rosacea & How can I treat it? Rosacea is a skin condition causing sensitivity, redness, flushing and sometimes, broken veins, whiteheads and skin disfigurement. It commonly affects the cheeks, chin and sometimes the nose. It can cause the skin to be hot, inflamed and very sensitive to products. It can feel similar to mild sunburn. Rosacea typically appears between the ages of 30 and 50 and seemly affects more women than men. Rosacea is specifically a facial skin condition and although is often made worse by poor lifestyle, it isn’t directly correlated to a persons general health. Many people that have Acne-Rosacea don’t know they have it or think it will go away with time. The truth is, if left untreated, it will get worse and become much harder to correct and manage. The exact cause of rosacea is still relatively unclear. There are many theories that include an allergy to a natural mite that lives in our skin and a link to a bacterium that lives in our upper colon. It is also suggested that people prone to flushing and those regularly in outdoor or harsh weather environments are more likely to develop rosacea type symptoms. If our skin is thin, sensitive or damaged, it will not cope well with aggressions that we face everyday. Environmental stress such as sun, wind, air conditioning or pollution exposure, and internal reactions like the warmth we get when drinking alcohol, will cause a reaction within the skin. Because the skin is compromised and unable to defend itself against this reaction and the body will send blood to the area as a defence mechanism. The presence of blood brings oxygen, white blood cells and immunity to try and correct the effect of these aggressions. But it will also bring redness, heat and inflammation. Over time, if this flushing of occurs regularly the blood capillaries under the skin will burst, the redness will become more permanent and the skin will become even more vulnerable leading to the degradation of skin integrity and rosacea symptoms getting worse. There are common triggers that aggravate rosacea. Sun exposure is the most severe, followed closely by stress and extreme weather, alcohol and the wrong skin care products. 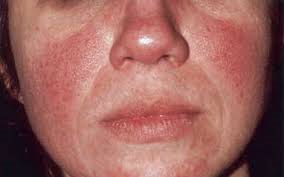 Subtype 1 (erythematotelangiectatic rosacea), characterized by flushing and persistent redness, and may also include visible blood vessels. Subtype 2 (papulopustular rosacea), characterized by persistent redness with transient bumps and pimples. Subtype 3 (phymatous rosacea), characterized by skin thickening, often resulting in an enlargement of the nose from excess tissue. Subtype 4 (ocular rosacea), characterized by ocular manifestations such as dry eye, tearing and burning, swollen eyelids, recurrent styes and potential vision loss from corneal damage. Subtypes 1 and 2 can be dramatically improved with good quality, cosmecutical skincare and there are a number of in clinic treatments available including soothing facials and enzyme peels. How can a product affect this? There are many ways good skincare can help the symptoms of rosacea. Calming ingredients like echinacea, vitamin E and Green tea will soothe and calm the skin. But cosmeceutical products that deliver ingredients to the lower layers of the skin can actually change the skin structure and function and help strengthen the skin, correcting the causes of the symptons associated with rosacea. Anti-oxidants neutralise free radical damage that cause weakening and degradation of skin cells. Stable forms of Vitamin C such as BV-OSC and L-Ascorbic acid can strengthen skin cells, and capillary walls, reducing the severity and length of flushing. It can also reduce the reaction of histamines in your skin that can cause swelling. Potent hydrating ingredients can restore essential water and oil levels in the skin, replenishing the body barrier repair meaning the skin can cope better with environmental aggressions and not require the presence of blood. This will also result in the correction of dry skin often associated with rosacea. Aqualance is a cosmeceutical ingredient that actively draws moisture from the air into the skin in a time release fashion over 8 hours. Vitamin A is a highly effective cell activator that can stimulate the production of your bodys collagen and elastin, and increase new skin production. It’s a potent skin revitaliser. IMAGE’s vital C range was designed specifically for the correction of rosacea. IMAGE founder Jana Ronertt suffered with rosacea and wanted to create a skin care range that would deliver exceptional results whilst being a pleasure to use. Vitamin C is one of the most potent anti-oxidants used in skin care and the foundation of all Vital C products. The Hydrating Anti-aging Serum contains a 15% blend of vitamin c as well as green tea, polypeptides and hyaluronic acid making it an exceptional product for the use in the correction of acne-rosacea. To compliment the good work you are doing at home with correcting skincare, enzyme facials containing vitamin C will help to boost cellular turnover and strengthen your skin. The Vital C Signature facelift is results driven treatment that will change the appearance of your skin in just one session. Vitamin C, fruit enzymes and aloe vera with anti-inflammatory botanicals reduces redness. hyaluornic acid adds moisture to dry/dehydrated skin. This facial will gently exfoliate while infusion the skin with potent anti-oxidants. There are also a great number of lifestyle choices you can make to help reduce the symptoms and severity of rosacea. Avoiding alcohol, smoking, extreme temperatures and wearing an SPF sun protector every day will all aid your progression. To ask your IMAGE specialist about how to treat your rosacea both at home, and in clinic, click here to find your nearest stockist. What can I use for Sensitive Skin?